Sales Order (PO) – a customer provides a written order detailing the goods or services they wish to buy. Purchase Order (PO) – A business sends a written order to a supplier for the purchase of goods or materials. Invoice from suppliers – A business buys goods or services from a supplier and receives an invoice from the supplier. Note the goods or services received should correspond to the details on the purchase order. Invoice sent to customers – A business sells goods or services to a customer and sends an invoice to the customer. The details on the invoice should correspond to the details on the sales order. Credit notes from suppliers for purchases returned, or to customers for sales returned. Credit notes are sent out when goods or services are returned to the supplier by the customer. The credit note contains the same information as an invoice but is usually printed in red. In effect credit notes negative sales invoices. Receive Of Goods Notes (ROGN) –These are sent with goods as they are shipped to the customer. The ROGN is used to book the goods into the warehouse. A copy of the ROGN is usually sent to the accounts department before an invoice can be paid. In the early days of accounting the information on the source documents was copied each day by a clerk into a book. This book is the source of any accounting entry, and gives it authority; it is called “a book of prime entry”. 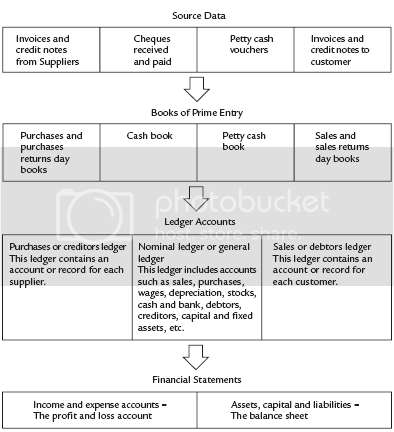 There is no such thing as a typical accounting system as many of these books have been computerized or replaced by files of invoices which carry out the same function. However, familiarity with the purpose, use and effects of these important accounting documents will help you understand how basic accounting systems work. This book records all the sales invoices which a business has sent out to its customers. Every sale, both cash sales and on credit, should have an invoice raised. These invoices should be recorded in the sales book. Each page of the sales book is sequentially numbered to assist in the financial control of sales. At the end of each day, each invoice should be entered, or ‘posted’, to the individual customer’s account in the sales ledger. This ledger contains an account for each customer and shows the business how much is owed by each of its customers i.e. its account receivable. The customers’ accounts can be found by reference to the sales ledger page. Periodically, the total of the sales book page is analyzed between cash sales and credit sales and the totals posted or entered to the Sales account. The wrong goods may have been supplied. This return may be for all the sold goods, in which case the entire original invoice has to be cancelled. Alternatively, only a few of the goods are returned, in which case only part of the invoice may be offset. To achieve this, credit notes are issued. The sales returns book should be completed in exactly the same way as the sales book in respect of goods returned from customers. When the individual entries are made to the sales ledger they will reduce the amount owed by the customer. The sales returns will also reduce the sales achieved by the business. This book contains information about the purchases made by a business and is a list of invoices from suppliers. It is completed in exactly the same way as the sales book, with each page being sequentially numbered. The invoice is the source document and describes the goods and services provided and the price the buyer has to pay. It will also contain a cross-reference to the order number issued by the business to raise the purchase. The individual invoices will be posted to the supplier’s accounts in the purchases ledger which contains an account for each supplier. This account will record the individual invoices received from the supplier and ultimately the payments made to the supplier by the business. For accounting purposes ‘cash’ includes: cash, checks and bank transactions, unless specified as ‘cash on hand’ or ‘petty cash’ (read the next section). The cash book records all ‘cash’ transactions including coins, banknotes, checks, direct debits, and credit transfers and banker’s drafts. The cash book is split into columns for cash and bank transactions. The cash book has one page for receipts from customers depending on whether it is in the form of cash or check. On the opposite side of the cash book will be a page for payments to creditors and for other expenses such as wages, electricity, etc. Sometimes an organization regardless of its size finds itself in a situation where it has to make or reimburse small-value payments. Such payments may be for stamps, taxi fares, tea or coffee for the office or emergency purchases of stationery. Most businesses keep a small amount of cash on their premises for this purpose. This cash or float is called a “petty cash account”. As the cash used to finance the petty cash float is normally transferred from the bank account it is in effect a subsidiary of the main cash book. Petty cash payments and receipts are recorded in a petty cash book. The petty cash is usually the responsibility of the petty cashier. A fixed float is given to the petty cashier. When a purchase is made, a petty cash voucher is completed and filed, together with the proof of purchase such as a receipt. At any one time the balance of the petty cash plus the total of all the petty cash vouchers should equal the amount of the original cash float. This method acts as automatic internal check on the accuracy and honesty of the cashier. When the petty cashier needs to replenish the float he/she presents the vouchers to the main cashier who then reimburses the petty cashier with cash equal to the value of the vouchers. The petty cash vouchers are then entered in the expense accounts of the main accounting system. The journal is used to make entries in the ledger that cannot be made through the other books of prime entry. Examples are the correction of posting errors in the ledger or the formal entry of accounting adjustments, such as depreciation and accruals, at the end of the year; correction of errors and large or unusual transactions. Personal accounts of the customers (debtors) which are kept in the sales ledger. Personal accounts of suppliers (creditors) which are kept in the purchases ledger. Impersonal accounts, which includes accounts such as sales, purchases, wages, depreciation, stocks, cash and bank, and fixed assets, capital and liabilities, etc. It will also include the total receivable and total payable of the business. These accounts are kept in the nominal ledger. The sales ledger contains an account or record for each customer. Invoices raised will be posted to the account to increase the customer’s indebtedness, while credit notes will be posted to reduce their indebtedness. Any cash received will be posted to the cash book and to the customer’s account to reduce their indebtedness. The balance column on the account shows at any one time how much is owing to you by that customer. This will be completed in a similar manner to the sales ledger. This ledger contains an account or record for each supplier. Invoices received will be posted to the account to increase the amount owed to the supplier, whilst the credit notes will be posted to reduce the business’s indebtedness. Any cash paid will be posted to the cash book and to the suppliers account to reduce the business’s indebtedness. The balance column on the account shows at any one time how much is owed by the business to that supplier. This ledger is made up of all the non-personal accounts – in contrast to the personal ledgers which include the names of customers and suppliers. Fixed assets at cost – a separate account for each type of fixed asset, e.g. motor vehicles, machinery, etc. Provision for depreciation of fixed assets – a separate account for each provision, e.g. provision for depreciation of motor vehicles, provision for depreciation of motor vehicles, etc. Capital account – of owner. Expense accounts – a separate account for each expense, e.g. salaries, heating, bank charges, petrol, etc. These accounts form the basis for preparing the profit and loss account and balance sheet.